Would you pay a grand for a shoe made of trash? Well, you might if it sports Christian Louboutin’s iconic red sole. Available at Neiman Marcus for no less than $1,095, the luxury designer’s new “Ecotrash” slingback incorporates actual detritus from the atelier’s dumpster, including thread, postage stamps, leftover sequins, and fabric swatches from past seasons. Although the shoe gets a gold star for effort, we’re not completely “soled” on the toxic coat of PVC that makes up most of the pricey platform. And genuine python skin? Hardly sustainable. Nix those two and bring down the price tag a notch, CL, then we’ll talk. Would you pay a grand for a shoe made of trash? 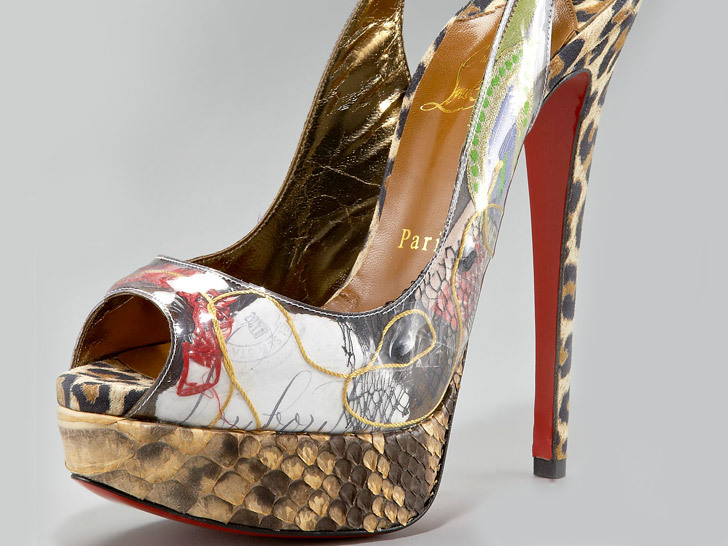 Well, you might if it sports Christian Louboutin's iconic red sole. Available at Neiman Marcus for no less than $1,095, the luxury designer's new "Ecotrash" slingback incorporates actual detritus from the atelier's dumpster, including thread, postage stamps, leftover sequins, and fabric swatches from past seasons. Although the shoe gets a gold star for effort, we're not completely "soled" on the toxic coat of PVC that makes up most of the pricey platform. And genuine python skin? Hardly sustainable. Nix those two and bring down the price tag a notch, CL, then we'll talk.